The precious pearl – adored by the world since the ancients — is June’s official birthstone. Today we’re featuring one of the most celebrated natural pearls, La Peregrina, whose history is steeped in both legend and lore. Meaning “pilgrim,” La Peregrina was considered a treasure for Spain, and has been called the largest, finest example of a teardrop-shape natural pearl, weighing in at 55.95 carats. After its discovery in the Gulf of Panama in the 16th century, King Phillip II of Spain gave the pearl to Queen Mary I (Mary Tudor). It has also been owned by Spanish royalty, the Bonapartes of France, and the British Marquis of Abercorn. In 1969, Richard Burton spent $37,000 (outbidding a prince at Sotheby’s) to buy La Peregrina for Elizabeth Taylor as a gift for Valentine’s Day. La Peregrina, which sold at auction in 2011 for a record $11.8 million, was rumored to be nearly eaten by Taylor’s dog shortly after she received it. In a Caesars Palace suite, Taylor was wearing the pearl on a delicate pearl and diamond chain. She suddenly realized it was gone. She looked down and saw her dog happily chewing on something, and in a split second, reached down and pulled the pearl and diamond pendant out of the dog’s mouth. The pearl was unscathed. Taylor then asked Cartier to reset La Peregrina with pearls, diamonds and rubies. She wanted the necklace to resemble the painting of Mary, Queen of Scots, who was wearing it as a choker. The pearl’s original setting can be seen in Taylor’s cameo in Anne of the Thousand Days (1969) – and the new, more exquisite setting in the films Divorce His — Divorce Hers (1973) and A Little Night Music (1977). Interestingly, the close call at Caesars wasn’t the only near-misfortune for La Peregrina. According to legend, it was once lost in a sofa at Windsor Castle – and a duke’s wife once misplaced it at a family wedding and later found it in the bride’s train. Natural pearls like La Peregrina are exceedingly rare and treasured because they are created by mollusks randomly, without human intervention. When a grain of sand or similar irritant sidles between the mollusk’s shell and its mantle tissue, the process begins. To protect itself, the mollusk instinctually secretes multiple layers of nacre, an iridescent material that eventually becomes a pearl. Cultured pearls, by contrast, are created when a bead is embedded inside the body of the mollusk to stimulate nacre secretion. 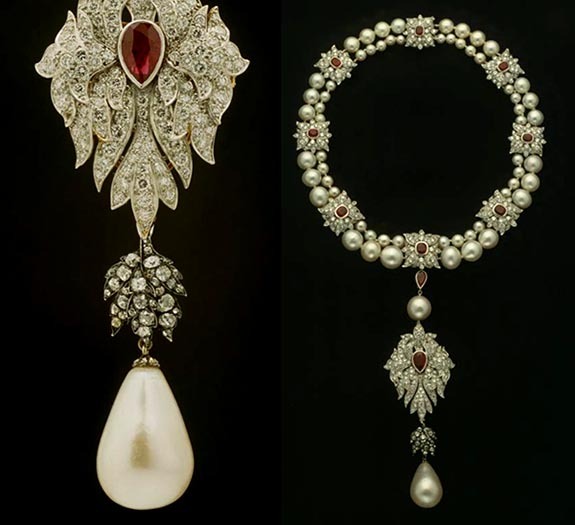 In 2005, La Peregrina was one of 12 rare pearls featured during a six-month exhibition at the Smithsonian National Museum of Natural History called “The Allure of Pearls.” Other specimens included the Hope Pearl, the Drexel Pearl, the Black Beauty, the Pearl of Kuwait, the Queen Mary Brooch with two large natural pink conch pearls, the South Sea Drops, the Survival Pearl, the Pearl of Asia and the Paspaley Pearl. La Peregrina was loaned for the presentation by Elizabeth Taylor, of course. Credits: Images courtesy of Smithsonian/NMNH Photo Services. Dance superstar Stephen "tWitch" Boss helped choreograph an elaborate flash mob marriage proposal that Austin natives Patrick Barker and Johanna Alvarado will never forget. Barker had met tWitch on The Ellen DeGeneres Show, where the former So You Think You Can Dance alum has become the resident DJ. The break dance and hip-hop specialist just launched a new web series called "tWitch, Please... Help Me Dance!" — so when Barker hinted that he was planning to propose to his girlfriend, tWitch had the perfect plan. 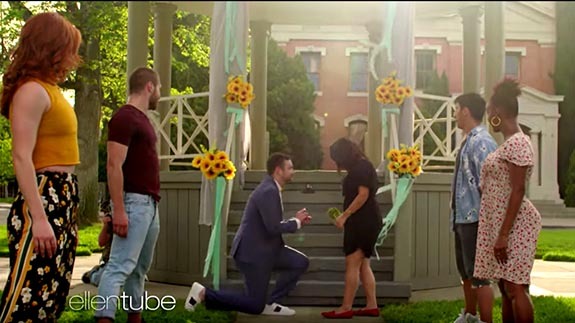 tWitch's ultimate surprise proposal takes place on the back lot of Warner Bros. studios. Alvarado believes she's taking a standard studio tour, but the scene quickly morphs into an elaborately choreographed flash mob — starring her boyfriend, tWitch and a troop of professional dancers. The "tWitch, Please... Help Me Dance!" video shows Barker working on his dance moves under tWitch's tutelage. tWitch tells the groom-to-be that learning the moves will not be easy, but the end result will be well worth it. "After this work, they'll be stories you can tell for years and years to come," tWitch says. 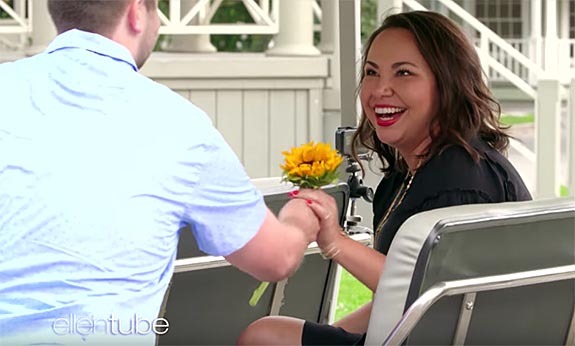 As the couple rides onto the Warner lot in a tour cart, the guide tells them and the other passengers that they need to be extremely quiet because they are about to witness the taping of a commercial. 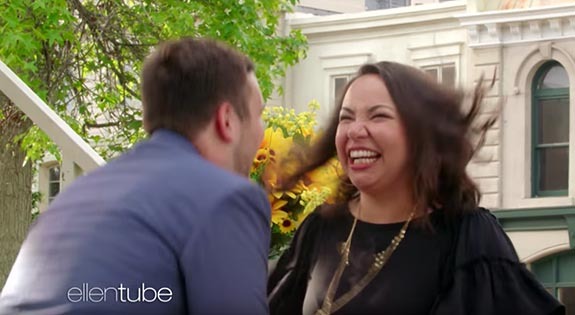 Just then, she hears the opening refrain from Bleachers' "Let's Get Married" and the other passengers — actually professional dancers — take their places on the set. Barker hands Alvarado of sunflower and joins the dance troop. Alvarado is overwhelmed as a storybook flash mob marriage proposal plays out in front of her eyes. The future bride gets even more emotional when her parents and Barker's parents make a surprise appearance. In the final scene, the bride is led from the tour cart to a gazebo, where her boyfriend has completed a costume change and is ready to propose. Says Barker, "This is for you. This is for us. I love you so much and I want to spend the rest of my life with you. Will you marry me?" "Yes, of course," she answers. Alvarado is so excited, bouncing up and down, that Barker has a hard time trying to get the diamond ring on her finger. Finally, with the ring securely in place, the couple embraces, the music resumes and the dancers celebrate by doing what they do best. When asked by an interviewer how she felt about the flash mob proposal, Alvarado commented that she was "beyond happy." "It was magic," she said. Credits: Screen captures via YouTube.com/TheEllenShow. 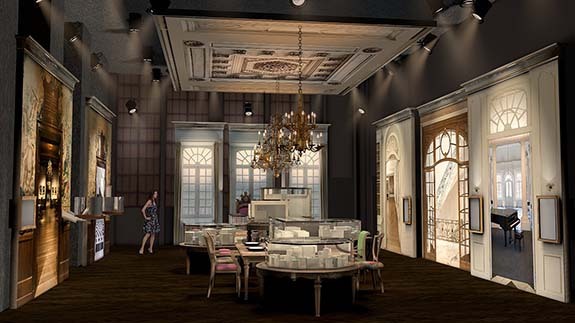 Antwerp's brand new "DIVA" museum celebrates the Belgian city's 570-year love affair with diamonds. Since the 15th century, traders from around the world journeyed to Antwerp to buy and sell luxury items, and the DIVA museum tells that story in a most unique way. Jérome, a virtual butler, escorts visitors through the "house" of a fabulously wealthy fictional mistress. Through the use of soundscapes, multimedia, interactive elements and actual artifacts, each of the six rooms explores a different aspect of the city's history. 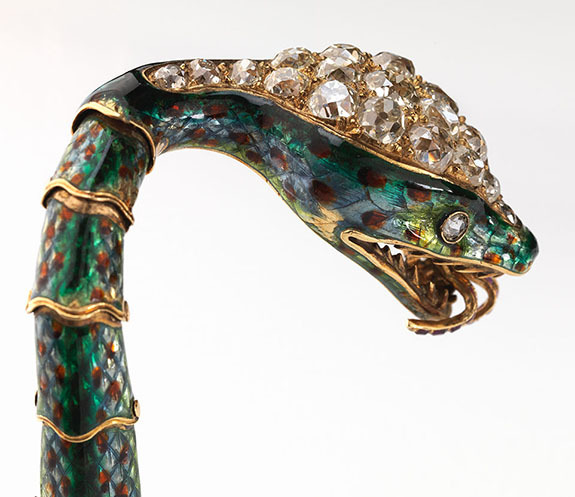 Visitors will marvel at 600 objects, including diamond-encrusted boots, a stunning owl cup and bejeweled peacock brooch. The first steps inside DIVA’s house take the guest into her amazing Wunderkammer, a luxurious chamber exhibiting a collection of curiosities and objects from every corner of the globe. Among the items are silverware, jewelry, precious stones and other highly sought-after items of yesteryear, including coconuts, shells and coral. The Atelier is a room where the visitor can sit at a workbench and learn how beautiful jewelry was made. Demonstrated are the arts of diamond-cutting and silversmithing. 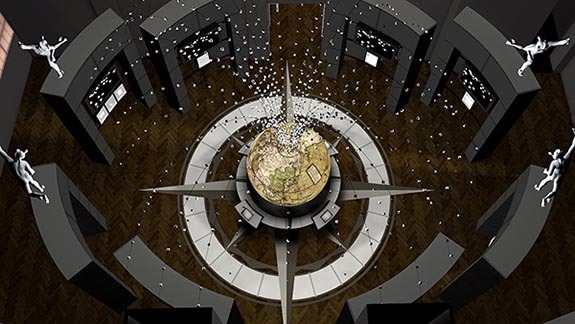 Next, DIVA’s butler takes visitors to the International Trading Room, where a large, multimedia globe makes it instantly clear why Antwerp was — and still is — the diamond center of the world. Projected trade routes illustrate how diamonds have made their way to and from Antwerp for the better part of six centuries. In the Dining Room, guests are invited to take a seat at DIVA's surrealistic arrangement of tables, decked out with silver services worthy of the grandest of banquets. The rules of etiquette and stories about some of Antwerp’s aristocratic families shed light on the use of silver and the lifestyles of the rich and famous. 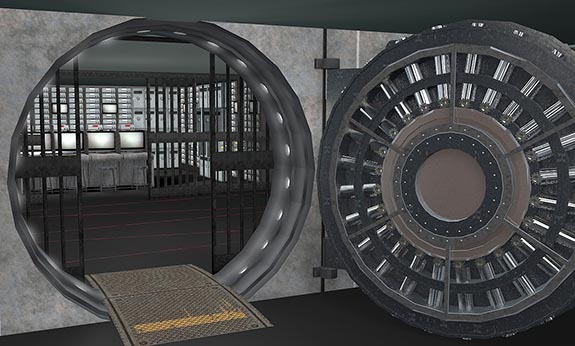 The fifth room is The Vault. Visitors must answer a few questions to gain entry, and they are rewarded with access to an abundance of information about diamond security. Lastly, guests are escorted into The Boudoir, where DIVA keeps her most most dazzling and precious jewelry treasures. 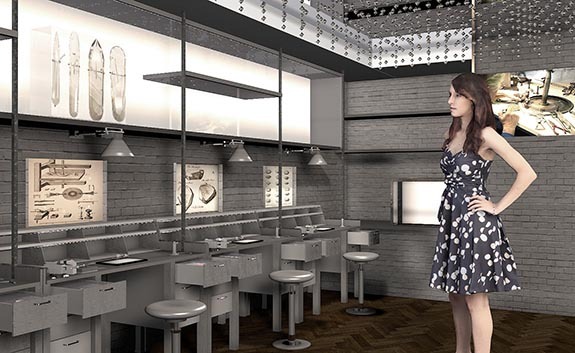 DIVA: Antwerp Home of Diamonds is open to the public every day except Wednesday. Cost of admission is 10 Euros ($11.78) for adults, 7 Euros ($8.24) for those under 26. Children under 12 may visit for free. Credits: All images © DIVA. Peacock by White Light. Snake by Dominique Provost. All other images by Carla Janssen Hofelt. Welcome to Music Friday when we bring you uplifting songs with jewelry, gemstones or precious metals in the title or lyrics. Today, alt-country rocker Ryan Adams compares a glorious, sunny day to June's official birthstone in his 2007 ditty, "Pearls on a String." The song, which appeared as the ninth track on the artist's ninth studio album Easy Tiger, is a celebration of all the wonderful things life has to offer — with a special emphasis on nature's beauty and the joy of music. He sings, "Blue eyes for miles / Pretty as a peach / Glorious kind and always on time / Never far outta reach / Tomorrow's on it's way / And there's always new songs to sing / Glorious kind, always on time / Pearls on a string." 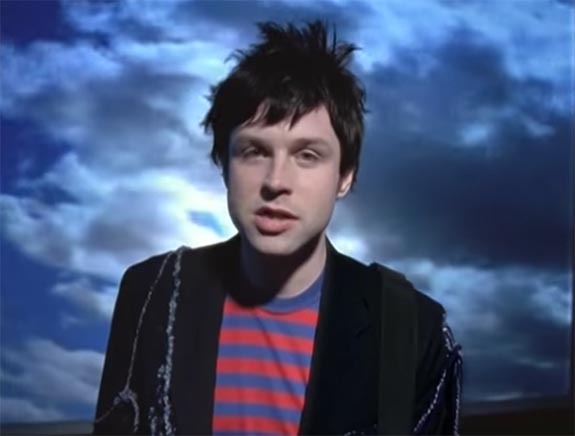 In an interview with Australia's Herald Sun, Adams explained that the songs featured on Easy Tiger are "strays" that arose from a writing project that was originally intended to go in a different direction. "They are very, very simple, very easy songs that, in my opinion, were written on the periphery of some more complex work," he said. "These were the tunes around them that just kind of happened. It's shocking to me how they happened." Easy Tiger made its debut at #7 on the U.S. Billboard 200 list and charted in 14 countries. The 43-year-old Adams has released 16 albums as a solo artist and three with his former band, Whiskeytown. Born in Jacksonville, N.C., Adams described his childhood as "dysfunctional." His father left the family when Adams was five, so he, his mom and siblings had to move in with his grandparents. At age eight, Adams began writing short stories and was inspired by the work of Edgar Allan Poe. At 14, he got his first electric guitar and soon joined a local band named Black Label. Adams dropped out of high school as a 16-year-old and performed with a number of local bands. He eventually earned his GED and built his reputation as a singer-songwriter, musician, multi-instrumentalist, record producer and poet. He's been called a "new Dylan" and "the Kurt Cobain of alt-country." In 2009, he famously married singer-actress Mandy Moore in a secret ceremony. They were divorced in 2015. Written by Bradley Smith Pemberton, Jonathan Graboff, Neal Graeme Casal and Ryan Adams. Performed by Ryan Adams. 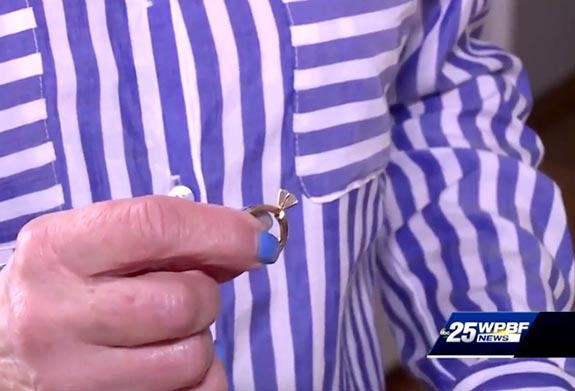 Former nurse and Jupiter, Fla., resident Carol Winig is on a mission to identify the honest little girl who found her engagement ring in a supermarket parking lot and turned it over to the store's management. Winig wants to give the youngster a reward and a big hug. 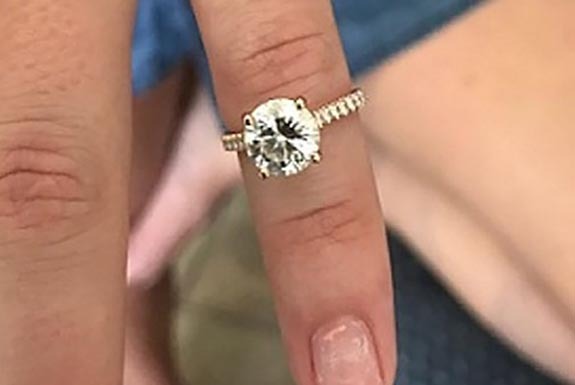 The six-year-old had spotted the diamond solitaire ring in the parking lot of a Publix supermarket on May 14 and promptly turned it in. The girl didn't give her name and her identity remains a mystery. Earlier that day, Winig had been shopping at the same Publix and stopped into the bathroom to wash her hands. She removed three rings from her hand — her engagement ring, a platinum wedding band and an antique wedding band that once belonged to her husband's grandmother — and slipped them into her back pocket. “As I did it, I put the rings in my back pocket and I said to myself, ‘This is probably not one of your better moves, putting them there. Just remember to take them out,’” she told local ABC affiliate WPBF. Winig forgot to take them out, and that's where her story takes a turn for the worse. Standing near her car with a cart of groceries, she reached into her pocket to pull out her receipt. Just then she heard a "ting, ting, ting" as her receipt dropped to the ground in the parking lot. What she failed to realize was that all three precious rings had fallen from her pocket and were left behind in the parking lot as she drove away. 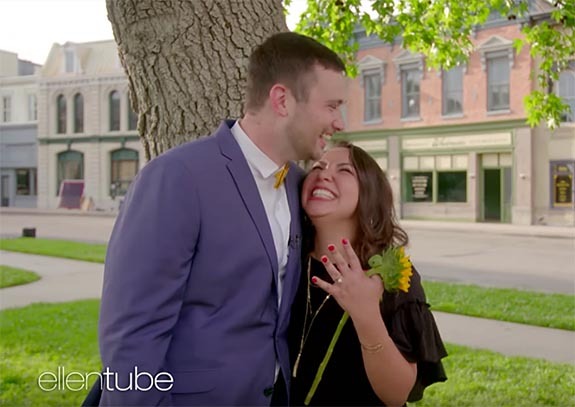 About 20 minutes later, at about 7 p.m., the mystery youngster found the most precious of the three rings — Winig's engagement ring — lying on the pavement. It was the ring Winig's husband gave her when he first proposed. The next morning, Winig realized that all three rings were missing, so she scampered back to Publix to try to find them. After searching the parking lot unsuccessfully, she entered the store and asked if any rings had been turned in. Management handed her an envelope with the engagement ring inside. “That’s my ring! That’s my ring!” Winig remembered saying to the staff. And then she cried as she placed it back on her finger. 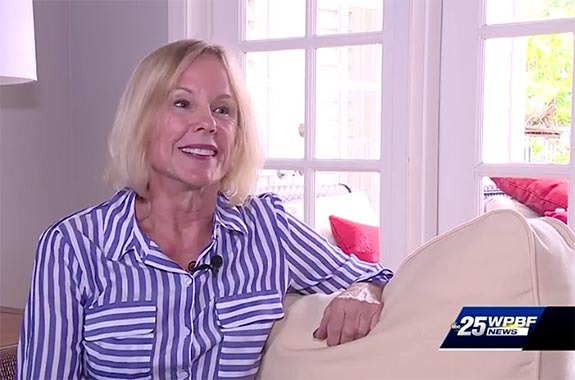 "For me, that was the most incredible gift to have been able to get the ring back," she told WPBF. Now, Winig is trying to find the honest, heroic young lady responsible for returning her ring. The staff at Publix did not get her name, just the fact that was six years old. “This little girl needs to be hugged and rewarded," Winig told WPBF. Winig's story has gotten a fair amount of media attention. It was covered by local ABC affiliate WPBF and was a featured on the website mypalmbeachpost.com, but the little hero has yet to come forward. Winig still holds out hope that the other two lost rings may eventually be found, but "that would be a miracle," she said. Credits: Screen captures via wpbf.com. The Diamond Producer Association's high-profile "Real Is Rare" campaign scored 1.5 billion media impressions among the coveted 21-to-34-year-old demographic during its first 12 months of advertising, according to an independent research firm. 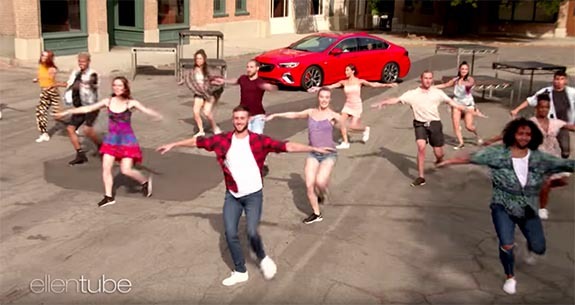 Aimed at making an emotional connection with millennials via a storytelling approach, the commercials reached 98% of its core audience, with each millennial exposed to the messaging 20 times over the course of the year. 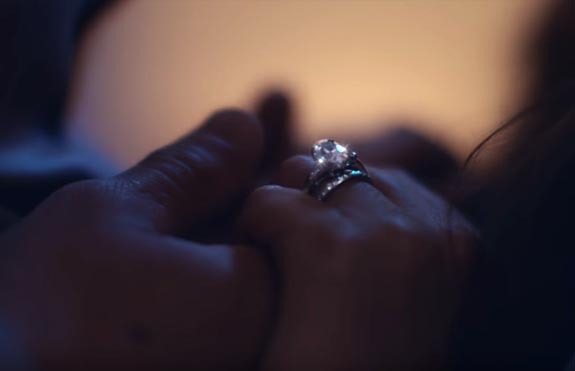 The independent, cross-media study by Kantar Millward Brown (KMB) revealed that the latest emotional storytelling videos, "The Other Party" and "Reveal," generated a significant increase in consideration of diamonds for purchase, as well as favorable opinions of diamonds and love for diamonds. "We are very pleased with the results, which confirm we are moving the needle on consumer sentiment," said Deborah Marquardt, chief marketing officer of DPA. "We see desire for diamonds improving, with consumers saying that diamonds are the ultimate gift of love, and an important part of rare and special relationships." DPA spent $40 million on the campaigns between June 2017 and June 2018. Television and digital video consumed 43% of the budget, while digital and social media accounted for 42% of the spending. Print (10%) and strategic out-of-home, including cinema (5%), rounded out the mix. The past year's campaign was so successful that DPA is raising its annual global budget to $70 million, of which $50 million will be invested in the U.S. for paid media, PR programs, research, education and advocacy initiatives. DPA plans to keep the current campaign through the end of the fourth quarter of 2018, but will debut a new campaign aimed at female self-purchasers at the end of the third quarter. "We recognize that we are still in the beginning stage of a long consumer journey," Marquardt noted. "We are learning as we go, and look forward to continued engagement and partnership with the industry and other stakeholders to inform our path forward." KMB's studies were conducted in December 2017 through January 2018, with a nationally representative sample among U.S. adults, aged 21 to 34. Credits: Image captures via YouTube.com. In 1940, billionaire banker and philanthropist David Rockefeller married Margaret "Peggy" McGrath, and during their 56-year marriage the couple collected magnificent works of art and fine jewelry. Yesterday, 19 jewelry items from their massive collection hit the auction block at Christie's New York, with most far outperforming pre-sale estimates. 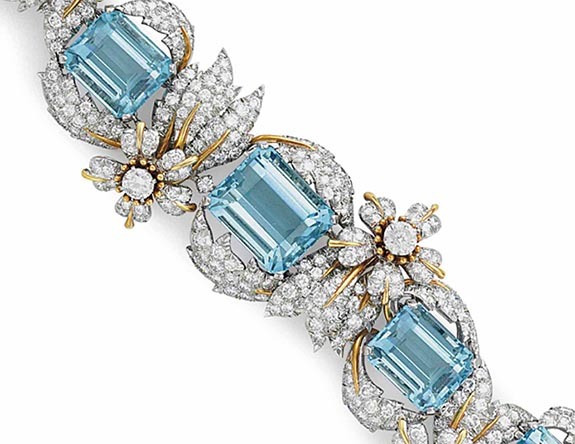 An aquamarine and diamond “Leaves and Flowers” bracelet (circa 1960) designed by Jean Schlumberger for Tiffany & Co., for example, was estimated to sell for $40,000 to $60,000. When the hammer went down, the bracelet had fetched $250,000 — more than four times the high estimate. Schlumberger designed the bracelet as a series of five rectangular-cut aquamarines weighing from 14.80 to 28.77 carats, within circular-cut diamond leaf surrounds, joined by circular-cut diamonds and polished gold links. 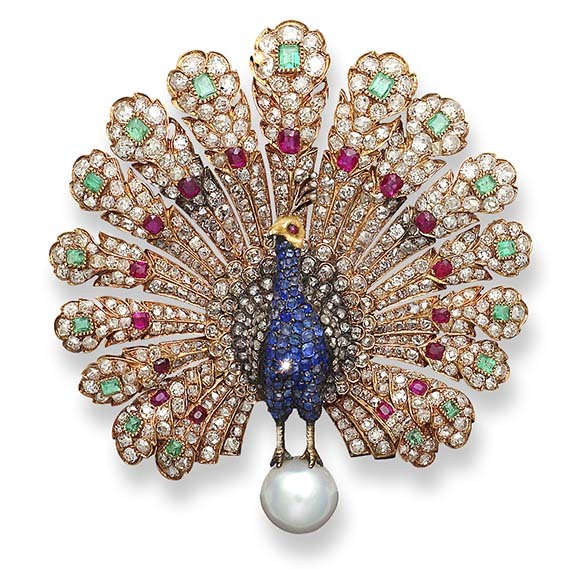 The jewelry offerings at Christie's represented the continuation of the auction house's mammoth Rockefeller family estate sale of some 1,550 lots across six auctions. The proceeds of the sales — a tally that is likely to exceed $1 billion — will be used to support 11 philanthropies. Before David Rockefeller died in March of 2017 at the age of 101, he ordered that the bulk of his estate — including three homes, and a collection of museum-quality paintings, tapestries, furniture and fine jewelry — would be used to fund bequests to his favorite charities. His beloved wife had passed away in 1996. 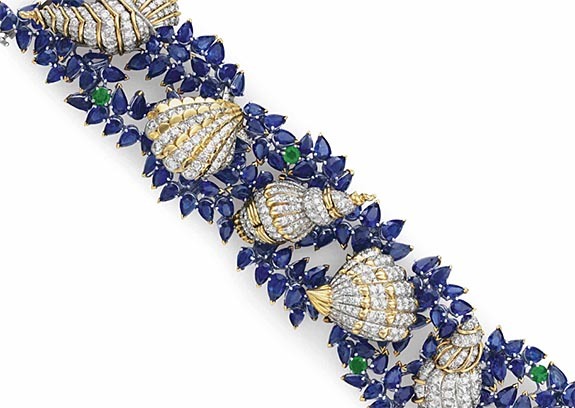 • Also designed by Schlumberger for Tiffany & Co., circa 1958, is this sapphire, diamond and emerald "Sea Shells" bracelet. Christie's set the pre-sale estimate at $50,000 to $70,000, but the realized price was $250,000. The pear-shaped sapphire and circular-cut emerald openwork band is set with six diamond-embellished sculpted gold shells. 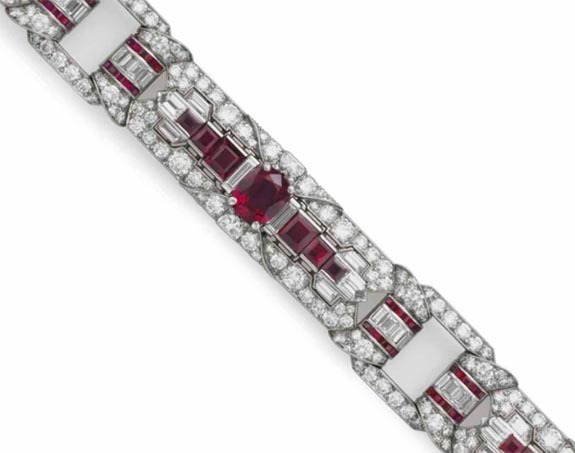 • This ruby and diamond bracelet by Raymond Yard, Rockefeller's personal jeweler, is designed as three articulated circular and fancy-cut diamond panels, each centering upon an oval-cut Burmese ruby. The pre-sale estimate was $40,000 to $60,000, but the selling price climbed all the way to $348,500. 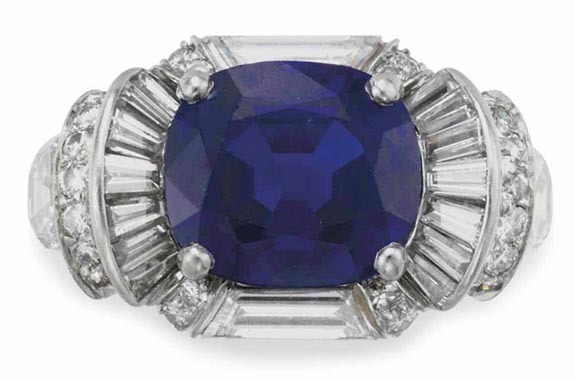 • Another Yard piece (circa 1944) — a sapphire and diamond ring — was one of the auction's top lots. Originally expected to sell in the range of $150,000 to $200,000, the platinum ring set with a 5-carat oval-cut Kashmir sapphire and surrounded by circular, baguette and half moon-shaped diamonds sold for $372,500. 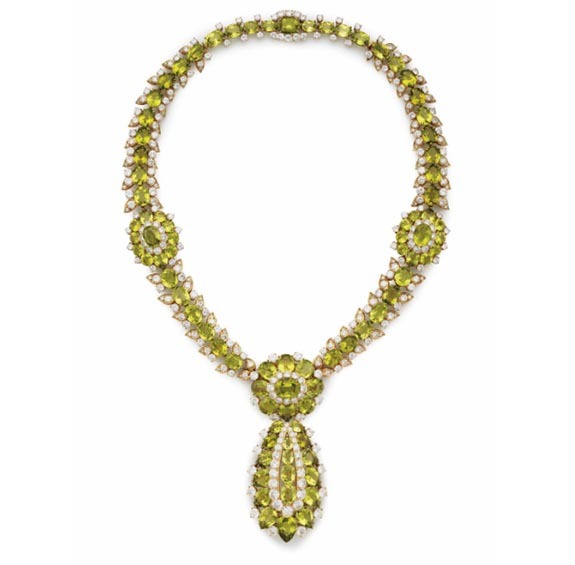 • Lot 174 of the auction included a suite of peridot and diamond jewelry by Van Cleef & Arpels. When the hammer went down at Christie's, the sale price of $348,000 had surpassed the pre-sale high estimate by $228,000. Suspended from the peridot necklace is a detachable pear- and oval-cut peridot pendant-brooch. Also included in the suite are peridot earrings, bracelet and ring. After more than 20 years of Sherlock Holmes-like sleuthing, scientists are crediting teeny, rapidly spinning diamonds for generating the curious microwave "glow" coming from a number of regions in the night sky. In a new study led by researchers at Great Britain's Cardiff University and published earlier this week in the journal Nature Astronomy, an international team has shown that it is likely the microwaves emanating from star systems far out in the Milky Way are coming from tiny crystals of carbon, otherwise known as nanodiamonds, inside of dust and gas that surrounds newly formed stars. For decades scientists have been able to measure a faint and mysterious stream of microwaves, dubbed the anomalous microwave emission (AME), but could never pinpoint the exact source. The microwaves seemed to be emanating from clouds of "spinning dust." "In a Sherlock Holmes-like method of eliminating all other causes, we can confidently say the best and likely only candidate capable of producing this microwaves glow is the presences of nanodiamonds around these newly formed stars," said lead author of the study Dr. Jane Greaves from Cardiff University's School of Physics and Astronomy. Scientists used high-powered telescopes in West Virginia and Australia to monitor three young stars that were known to emit AME light. By studying the infrared light that was coming from the protoplanetary disks surrounding the stars, the team was able to match the infrared light with the unique signature that is naturally given off by nanodiamonds. The team noted that the unique signal came from rapidly spinning, hydrogenated nanodiamonds. These minuscule particles — hundreds of thousands of times smaller than a grain of sand — have a crystalline carbon structure surrounded by hydrogen-bearing molecules on its surface. 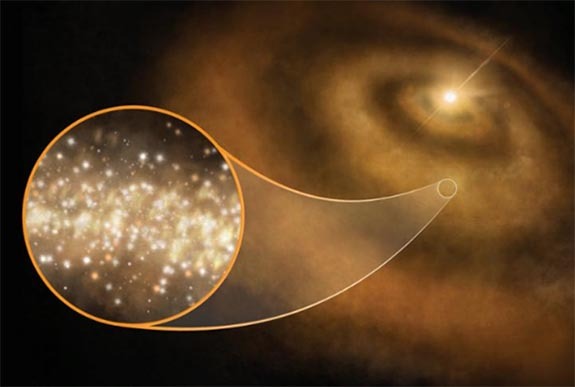 The nanodiamonds can occur, say the scientists, when carbon atoms become superheated in the highly energized star-forming regions of space. "This is a cool and unexpected resolution of the puzzle of anomalous microwaves radiation," Greaves continued. "It's even more interesting that it was obtained by looking at protoplanetary disks, shedding light on the chemical features of early solar systems, including our own." Credit: Image by S. Dagnello, NRAO/AUI/NSF. Welcome to Music Friday when we bring you the sweetest songs with jewelry, gemstones or precious metals in the title or lyrics. Today, country stars George Jones and Lacy J. Dalton sing the praises of a very special ring in their 1984 ditty, "Size Seven Round (And Made of Gold)." The song chronicles the love story of a couple, from their wedding day through their golden years. Even as they grow old together, her size-seven wedding band remains a shining symbol of their enduring relationship. They sing, "Size seven, round and made of gold / This circle joins us heart and soul / And it won't let our love grow cold / Size seven, round and made of gold." 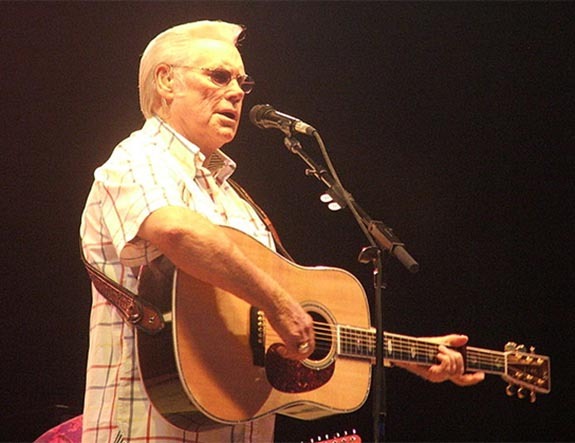 "Size Seven Round (And Made of Gold)" appeared as the seventh track of George Jones's 1984 album, Ladies' Choice, which was composed mostly of duets with female country artists. Twenty-one years later, the song returned on the 2005 reissue of the country legend's LP, My Very Special Guests. The song peaked at #19 on the U.S. Billboard Hot Country Singles chart and #11 on the Canadian RPM Country Tracks chart. Born in a log cabin in the small town of Saratoga, Texas, Jones got his first guitar at the age of nine. By 1955, at the age of 24, Jones had already served in the Marines, was married twice and recorded his first hit song, “Why Baby Why.” In 1969, he married Tammy Wynette. They were divorced six years later, although they continued to perform together after the breakup. Over a career that spanned seven decades, Jones is credited with charting 168 country songs. He was inducted into the Country Music Hall of Fame in 1992. Jones passed away in 2013 at the age of 81. Born Jill Lynne Byrem in Bloomsburg, Pa., Lacy J. Dalton scored a number of hits songs in the 1980s, including "Takin' It Easy," "Crazy Blue Eyes" and "16th Avenue." She's still actively touring at the age of 71. "Size Seven Round (And Made of Gold)"
Written by Monroe Fields and Gary Lumpkin. Performed by George Jones and Lacy J. Dalton. There's just no end to love that's true. Size seven, round and made of gold. Credit:Credit: George Jones photo by BstarXO Chester L. Roberts (Own work) [CC BY-SA 3.0 or GFDL], via Wikimedia Commons. The Philadelphia Eagles marked their historic 2017 season and epic Super Bowl triumph over the New England Patriots with championship rings emblazoned with 219 diamonds and 17 green sapphires. Each ring boasts a gemstone total weight of 9.15 carats. The 10-karat gold rings are teeming with symbols on every surface to tell the story of an underdog team that overcame all obstacles to roll through the playoffs and eventually defeat the Tom Brady-led Patriots by a score of 41-33 in Super Bowl LII. It was the first time the Eagles raised the Vince Lombardi Trophy aloft in their 85-year history. The top of the ring features the iconic eagle head logo rendered with 52 pavé-set diamonds to signify Super Bowl LII (52). The eagle head is set atop the Lombardi Trophy, which is, in turn, layered over a series of tapered-baguette green sapphires, fanned out in a circle. Ring manufacturer and designer Jostens noted that the rare green sapphires were specially sourced to match the official team color. The 13 sapphires represent the Eagles' 13 regular season victories, which tied a franchise record. The top of the trophy is adorned with three diamonds, representing the number of times the Eagles were deemed underdogs, and also the number of post-season victories it took to be crowned World Champions. A large marquise-cut diamond sits majestically at the top of the Lombardi Trophy to represent the first Super Bowl Championship in the Eagles' franchise history. Bordering the top and bottom of the top of the ring are the words “WORLD" and "CHAMPIONS” in raised white-gold lettering against a black enamel ground. The ring's bezel is adorned with a waterfall of 127 diamonds, a number that pays tribute to one of the most exciting and memorable moments in the team's history. "The Philly Special" was a trick play that resulted in a touchdown on a fourth-down-and-goal situation at the opponent's 1-yard line. Three key Eagles were involved in the memorable play, and the number 127 is the sum of their jersey numbers — Corey Clement (30), Trey Burton (88) and Nick Foles (9). Four round, genuine green sapphires adorn the corners of the base of the ring and symbolize the team’s four NFL Championships – three World Championships (1948, 1949, 1960) and one Super Bowl Championship (2017). The left side of the ring prominently shows the player’s name set above an end zone view of Lincoln Financial Field, the home of the Eagles. The stadium graphic pays tribute to the passionate and dedicated fan base that has supported the team since its formation. The player’s number is studded with pavé-set diamonds and set in the middle of the rendered football field. 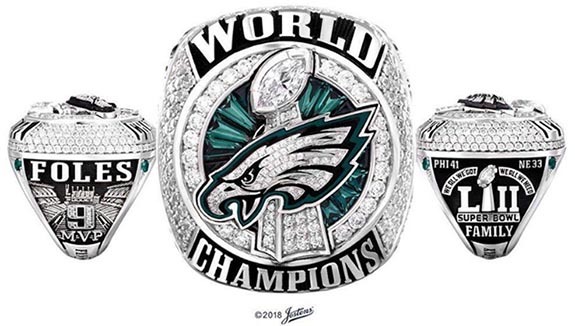 The right side of the ring features the score from Super Bowl LII (PHI 41 – NE 33), and one of the team’s messages of unity throughout the season, "We All We Got, We All We Need,” is set above the Super Bowl LII logo. The word “FAMILY” sits below the logo and serves as a reminder of the team’s commitment and dedication to each other. The words from the team’s fight song, “Fly Eagles Fly” are written on the bottom of the outer band. The top of the inside arbor of the ring is inscribed with the scores from the team’s three postseason victories and an image of an underdog mask, an acknowledgement of how the Eagles embraced their underdog role to galvanize the team, the fans and the entire city of Philadelphia. The bottom of the inside arbor is inscribed with each player’s signature – the first time championship rings have ever featured engraved signatures. Eagles chairman and CEO Jeffrey Lurie admitted that he didn't realize the level of consideration that goes into the design of a Super Bowl ring. The Eagles players and coaches received their rings during a special ceremony last week. In all, more than 400 rings were distributed to key personnel at every level of the Eagles organization. Credit: Image courtesy of Jostens. 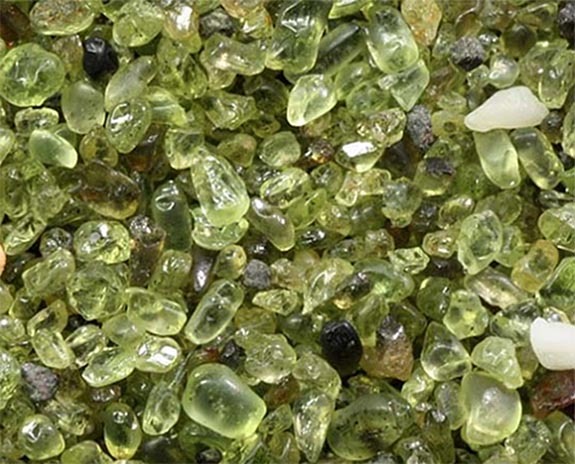 Twittersphere Buzz: Volcano Is Raining Green Gemstones on Hawaii... Or Is It? The Twittersphere was abuzz last week with the bitter-sweet story of how the destructive and horrifying volcanic eruptions of Kilauea were raining tiny green gemstones on the Big Island of Hawaii. On Monday, June 11, Twitter user @ErinJordan_WX wrote, "Friends of mine live in Hawaii, right next to the area impacted by the most recent lava flows. In the midst of the destruction nearby & stress of the unknown, they woke up to this — tiny pieces of olivine all over the ground. It is literally raining gems. Nature is truly amazing." Within days, major media outlets breathlessly reported that "Hawaii's volcano is literally erupting gems." 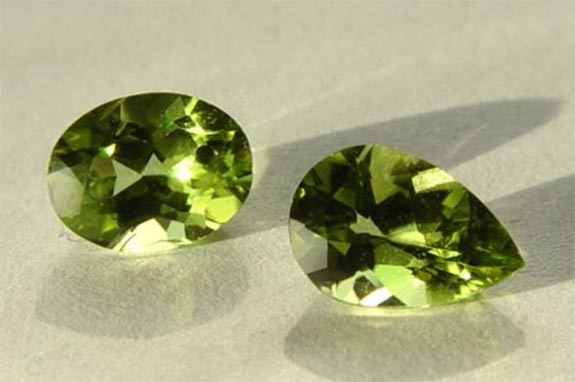 They explained how olivine — the non-gemstone variety of the August birthstone peridot — is a common mineral component of Hawaiian lavas and one of the first crystals to form as magma cools. These outlets explained the raining-gemstone phenomenon this way: "As the volcano erupts, it blasts apart molten lava, allowing for green olivine minerals to be separated from the rest of the melt and fall as tiny gemstones." Later in the week, however, other outlets questioned how large gobs of molten lava would instantaneously release the olivine crystals into the air. Cheryl Gansecki, a geologist at the University of Hawaii at Hilo, told sputniknews.com that the green gems seen in the photos circulating online do not separate from the lava themselves and had likely come out during past eruptions. "There is not olivine raining from the sky, except in clumps of lava. If you happen to be where tephra is falling from the sky, there [are] tiny olivines embedded in it, but you probably aren't going to see them," she said. Natives of Hawaii's Big Island are well aware of the association between olivine and volcanoes. 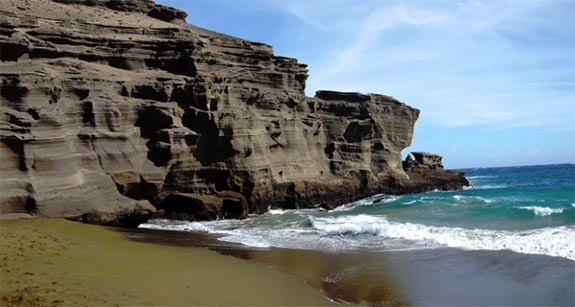 Mahana Beach on Hawaii’s Papakolea coast, for example, is one of only three green sand beaches in the world. The abundance of olivine crystals filling the beach comes from the eroded cutaway interior of Pu’u Mahana, a volcanic cone produced more than 49,000 years ago by the explosive combination of lava and groundwater. Locals have an affection for peridot and refer to the gemstone as the “Hawaiian Diamond.” Small peridot stones are sold as “Pele’s tears” in honor of Pele, the goddess of volcanoes. In ancient Hawaiian chants, Pele was described as “She-who-shapes-the-sacred-land,” and her temper was known to be both as abundant and dangerous as the lava. The latest eruption of Kilauea, one of the most active volcanoes in the world, began in early May and has since destroyed as many as 600 homes on the island. Credits: Tiny olivine pebbles by Siim Sepp (Own work) [CC BY-SA 3.0], via Wikimedia Commons. Faceted peridot by DonGuennie (G-Empire The World of Gems – Die Welt der Edelsteine) (Own work http://www.g-empire.de) [CC BY-SA 4.0], via Wikimedia Commons. Papakolea Beach by Natarajanganesan [CC BY-SA 4.0], from Wikimedia. 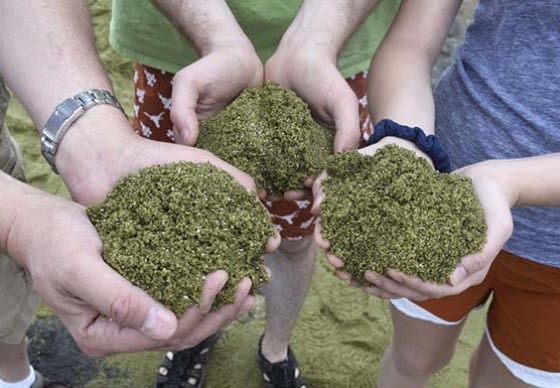 Handfuls of olivine-rich sand by Tomintx (Own work) [CC BY-SA 4.0], via Wikimedia Commons. On July 15, after a full month of heart-thumping competition, the members of a single national team will emerge as champions and experience one of the ultimate thrills in professional sports — raising aloft the 18-karat gold FIFA World Cup Trophy. Four years ago in Brazil, that honor went to the soccer team from Germany. This year in Russia, 31 teams will be vying to unseat the defending champs. The coveted trophy, which is 14.5 inches tall and depicts two human figures holding up the earth, is made of 11 pounds of 18-karat gold and features two rows of green malachite at the base. USA Today reported that the trophy is estimated to be worth $20 million, although the actual precious metal value is closer to $168,000. For years, FIFA, the governing body of soccer, had said the trophy was made of solid gold, but that claim hasn't held up to scrutiny and it's very likely that it has a hollow center. Martyn Poliakoff of the United Kingdom's Nottingham University did the math and determined that, based on its dimensions, a FIFA trophy made of solid gold would weigh an unwieldy 154 pounds. Gold is nearly 20 times as dense as water, and to get some perspective on just how heavy that is, consider this... A standard gold bar measures just 7 x 3 5/8 x 1 3/4 inches, but weighs more than 27 pounds. The winning team will be taking home a gold-plated replica of the actual trophy. The real one will remain in the possession of FIFA. The bottom of the base bears the engraved year and name of each FIFA World Cup winner since 1974. The names are not visible when the cup is standing upright. The tournament takes place every four years, and FIFA announced recently that the North American triumvirate of the U.S., Canada and Mexico will co-host the games in 2026. For the past 88 years, there have been only two designs for the FIFA trophy. The current one was conceived by Italian artist Silvio Gazzaniga and presented for the first time in 1974. In 1970, the Brazilians got to keep the previous version of the trophy — the Jules Rimet Cup — when the team captured its third world title. Rimet, the founding father of the FIFA World Cup, had stipulated 40 years earlier that any team that won three titles could have the cup permanently. FIFA made good on that promise in 1970, but in 1983 the cup was stolen in Rio de Janeiro and never seen again. 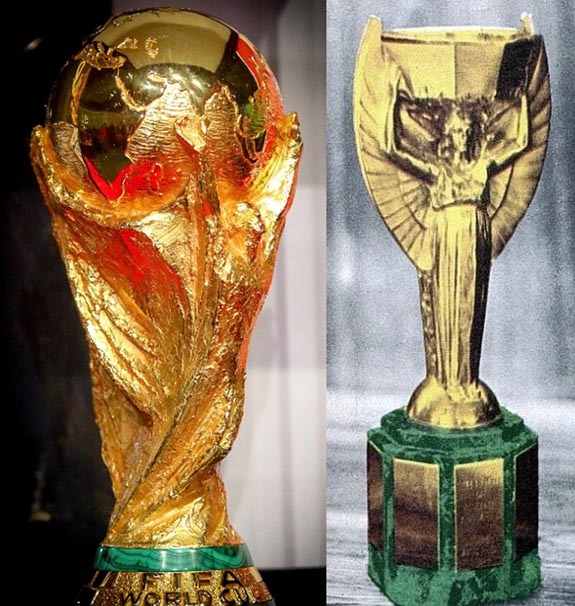 The Jules Rimet Cup, which was originally called “Coupe du Monde,” was designed by French sculptor Abel Lafleur and depicted the goddess of victory holding an octagonal vessel above her. It was 13.7 inches tall and weighed 8.4 pounds. It was made of gold-plated sterling silver, with a base of lapis lazuli. In 1966, an earlier version of the Jules Rimet Cup was stolen from a public display in London just before the Brits were about to host the World Cup. It was discovered seven days later at the bottom of a suburban garden hedge by a clever canine named Pickles. During World War II, the Jules Rimet Cup spent some time in a shoebox under the bed of FIFA vice president Dr. Ottorino Barassi, who feared it might fall into the hands of the Adolf Hitler and the Nazis. Brazil currently holds the record for the most FIFA World Cup victories (5), followed by Italy and Germany with four wins each. Favored teams in the current tournament include Brazil, Germany, Spain, France, Argentina, Belgium and England. 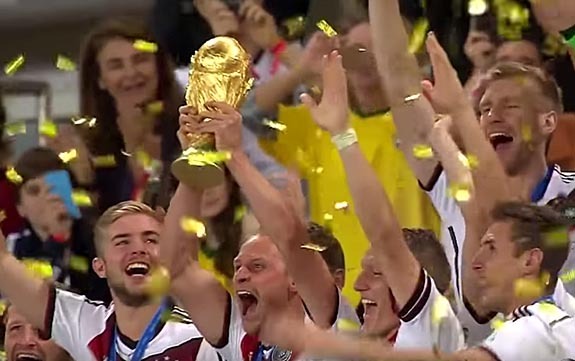 Credits: German team celebration in 2014. Screen capture via YouTube.com. FIFA World Cup by Biser Todorov [CC BY 4.0], from Wikimedia Commons. La Coupe Jules Rimet by Español: El Grafico del 12 de Julio de 1966. Edicion 2440 [Public domain], via Wikimedia Commons. 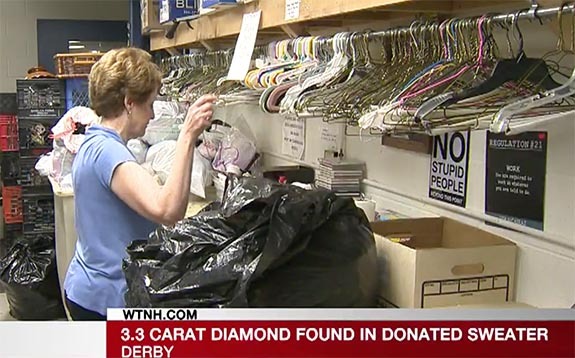 Workers at the St. Vincent de Paul Thrift Shop in Derby, Conn., went above and beyond the call of duty to reunite a woman with the 3.3-carat loose diamond she forgot she had pinned to the inside of a donated sweater. 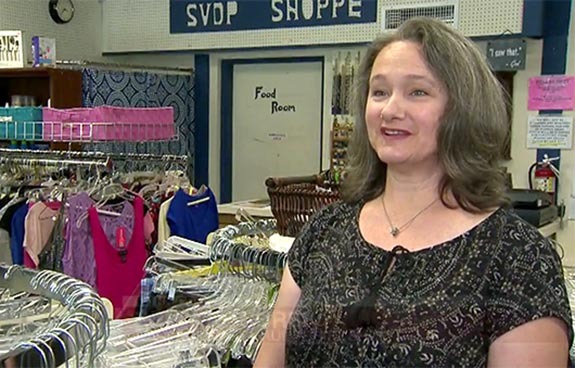 The store's Facebook page explained how one of the thrift shop's trusted sorters was carefully folding the grey sweater when she felt an unusual bump in the fabric. She turned the garment inside out and noticed a little black bag safety-pinned inside. She opened the bag to find another bag, and inside of that, a piece of thick blue parcel paper that is commonly used by diamond traders. 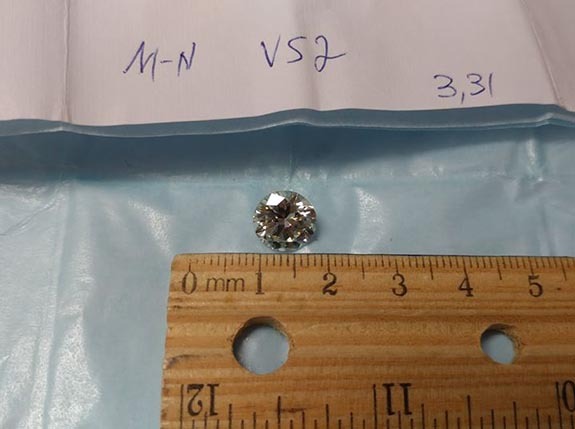 Tucked inside the folded paper was a round 3.3-carat diamond. Hand-written notes on the paper revealed the exact carat weight (3.31), clarity (VS2) and color grade (M-N). Diamonds with these characteristics typically sell for $30,000 or more. "We were in such disbelief that this could have occurred on our sorting table," shop director Remy Kocurek told ABC affiliate WTNH. The next task was to find the woman who had donated the sweater. They knew what she looked like, but they didn't have her name. The thrift shop workers reviewed their security videos and were able to glean the license plate number of the woman's car. The workers sought the help of the local police department, which was able to ID the car's owner and request that she return to the store. She complied with the police department's request, but was curious to know why she was summoned. "We asked her if she recalled donating the grey sweater and she said that she did. Very quickly, the color drained from her face as she realized what she had done. Collapsing into a chair, she shook her head and almost started crying. She hugged us and expressed her gratitude over and over at the return of a very valuable family heirloom. An exciting day at the best little thrift shop around!" "It just felt wonderful to do that for her," Kocurek told WTNH. It's still not clear why the woman had pinned an unmounted $30,000 diamond inside an old sweater. A safety deposit box may have been a better bet. Credits: Screen captures via wtnh.com. An eagle-eyed Long Island police officer with a metal detector and his quick-thinking colleague are being hailed as heroes after reuniting a Pennsylvania woman with the $20,000 engagement ring she lost last weekend on a Fire Island beach. What started out as a celebratory bachelorette weekend turned into a harrowing episode for a Pennsylvania woman last weekend. According to news sources, the woman and her friends were staying on Fire Island for her bachelorette party. On Saturday, after spending time on Atlantique Beach, she reported her diamond engagement ring missing. With her upcoming nuptials only a week away, the frantic bride-to-be was especially desperate to get the $20,000 ring back. Atlantique is a boater’s paradise located on the narrowest part of New York's bucolic Fire Island National Seashore. 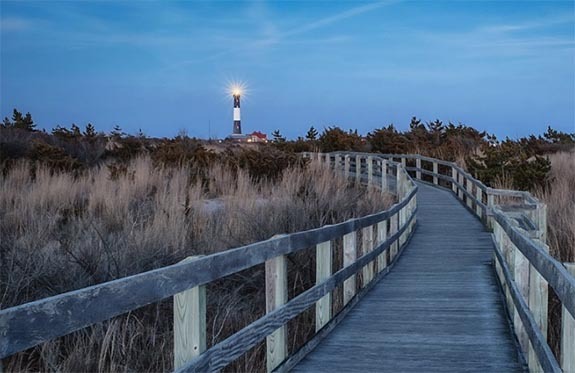 Boasting pristine beaches, quaint villages and an historic lighthouse, Fire Island is a popular tourist destination for families, daytrippers and sun worshippers. Covering 9.6 square miles, it is the large center island of the outer barrier islands parallel to the south shore of Long Island, N.Y., and about two hours east of New York City. The permanent population of just under 300 swells to thousands of residents and tourists during the summer. Marine Bureau Police Officer Robert Warrington responded to the call and set up a search of the home where the woman was staying. When nothing turned up, he called his colleague, fellow Bureau Officer Edmund McDowell, and suggested he bring his metal detector to Atlantique Beach the next day. Officer McDowell, who was assisted by the woman's friend, set up a grid pattern around where the woman was sitting at the beach. After about 10 minutes of carefully combing the sand, the large, round-cut diamond was found — along with a dime, a quarter and a rusty screw. When McDowell snapped up the ring and placed it on his own pinkie finger for safekeeping, the beachgoers cheered. “We called her up and she was crying and crying,” McDowell told Newsday. 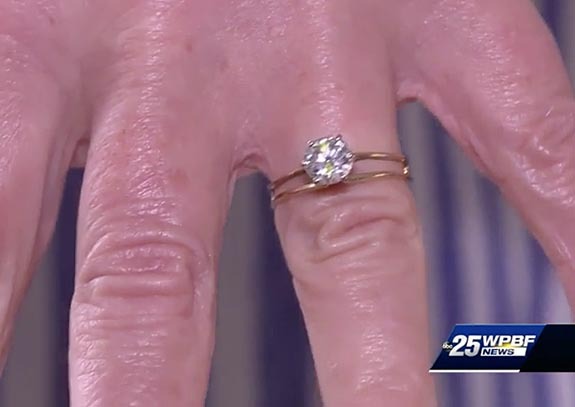 McDowell gave the ring along with the other items he found on the beach to the bride’s friend, who had stayed behind to lend a hand in the search. Each year, thousands of pieces of jewelry are lost at beaches from coast to coast. "If you have people who are swimming, you're going to have gold in the water," explained Dan Berg, an avid metal detectorist and author. Beachgoers cover themselves with suntan lotion and then sit in the sun, so their hands swell. Later, in the cool water, their fingers shrink and rings can slide off. According to Suffolk County police, this is the second time Warrington and McDowell teamed up to find lost treasure. About eight years ago, McDowell got a similar call from Warrington asking if he could use his personal metal detector to help find a $30,000 platinum and diamond wedding band that was lost in the sand by a man playing volleyball. “He’s such a nice guy and always goes above and beyond — and I like to help too — so between the two of us, I think we make a pretty good team,” McDowell told Newsday. Credits: Ring photo courtesy of Suffolk County Police Department. Fire Island Lighthouse by Mark Rosengarten [CC BY-SA 4.0], from Wikimedia Commons. Fire Island map by U.S. Department of the Interior / National Park Service [Public domain], via Wikimedia Commons. 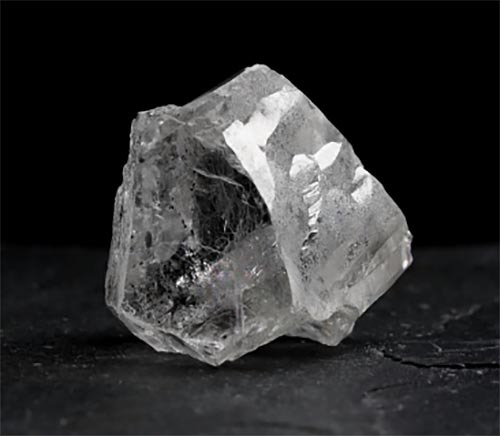 An all-star cast of 10 diamonds weighing a total of 1,453.06 carats yielded $32.5 million at Lucara Diamond Corp.'s "12th Exceptional Stone Tender" last week. The diamonds, which ranged from 40.4 carats to 472.37 carats, were all sourced in 2018 at the famous Karowe Mine in Botswana. The top performer was a 327.48-carat white diamond, which sold for $10.1 million, or $30,900 per carat. The largest gem in the group was a 472.37-carat “top light brown” rough diamond that rates as the third-largest ever discovered at the mine. While Lucara did not reveal the purchase price of the light brown gem, it did note that each stone in the tender was sold for more than $1 million and that four rough diamonds garnered more than $3 million apiece. Karowe continues to produce the world’s largest fine diamonds. 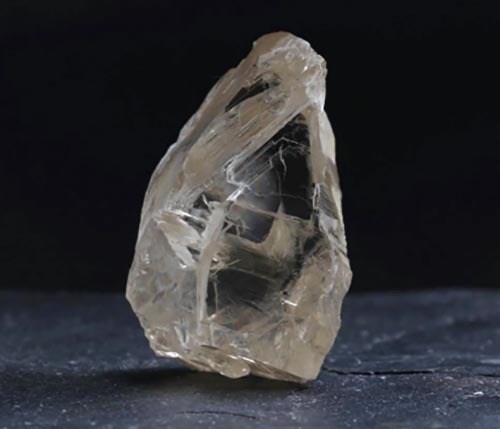 The 1,109-carat Lesedi La Rona and the 813-carat Constellation were both mined there in November 2015. Interestingly, Lesedi La Rona was the larger portion of a broken diamond. The other part weighed 373 carats. Lesedi La Rona was eventually sold for $53 million; Constellation earned $63 million; and the chunk that broke off Lesedi La Rona delivered $17.5 million. The recent proliferation of massive stones at Karowe can be attributed to Lucara’s investment in X-ray transmission (XRT) imaging technology. The new machines are calibrated to extract 100-carat-plus diamonds by monitoring X-ray luminescence, atomic density and transparency. Previously, large diamonds might have been mistaken as worthless ore and pulverized by a crushing device. In all, 29 diamantaires attended the "12th Exceptional Stone Tender," but only eight of them came away with at least one of the highly coveted lots. 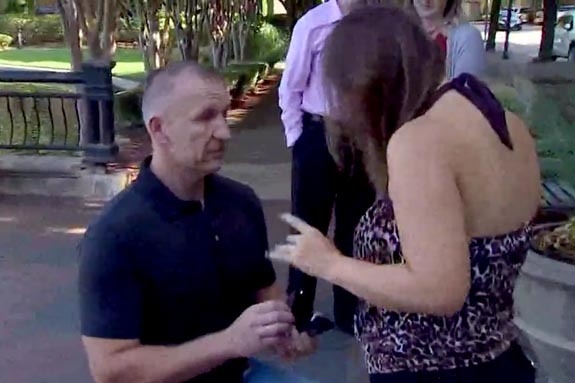 When Ben Adams and his girlfriend Elizabeth Kahle landed at DFW International Airport three weeks ago after a romantic European vacation, Adams was all set to surprise the love of his life with an engagement ring and marriage proposal. That plan got short-circuited when the airline misplaced their luggage and Adams had made the critical mistake of packing the engagement ring in his checked baggage instead of placing it in his carry-on. 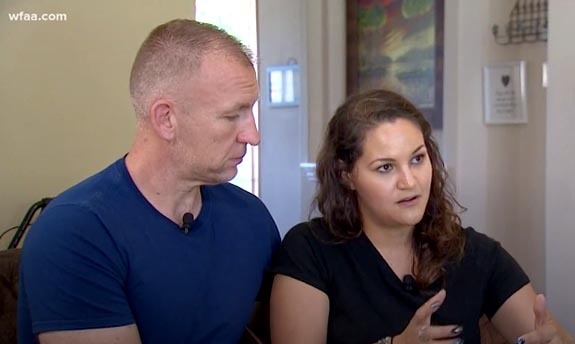 Earlier in the journey, the couple had been waiting for their connection in Iceland when they learned that their flight to DFW Airport in Dallas had been canceled. They were re-routed to JFK Airport in New York and then finally got a Delta flight to Texas that connected through Atlanta. With all the changes and crazy connections, the couple made it to Texas but the luggage did not. For more than two weeks WOW Airlines couldn't tell the them where their luggage had ended up. Both Adams and Kahle work for Norwegian Cruise Lines and don't really have a permanent residence. Kahle has family in Frisco, Texas, and that's why Adams wanted to propose when they landed, so they could all celebrate together. Instead, Adams reached out to local ABC affiliate WFAA to reveal his proposal secret and plead his case. “The stakes just went from here to here!” Kahle said in the interview. With the helpful prodding of the TV station, WOW was able to find the luggage, which had somehow ended up in Boston. “We didn’t even go through Boston,” Adams said. The luggage was forwarded to Texas, where Adams was finally able to pop the question. WFAA was on hand to document the moment and deliver a happy-ending story to its viewers. TSA blogger Bob Burns noted that under no circumstances should travelers pack their fine jewelry in checked luggage. "It’s perfectly OK to wear your fine jewelry through the checkpoint station," he wrote. "As long as the jewelry is not really bulky, travelers should keep their precious possessions on their bodies as they walk through metal detectors or high-tech imaging devices. Fine jewelry items that are not worn should be placed in a carry-on bag that should never be left unattended." Burns added that travelers should never place their valuables in the plastic bowls that the TSA provides to hold smaller items. Bowls can tip over on the conveyor belts, seemingly sending small jewelry into another dimension where it is never seen again, according to Burns. • Pack light and take only the jewelry you’ll wear while traveling and at your destination. The 4-carat diamond ring you save for special occasions? Probably not. The pearls that go with everything? Definitely. • List all the jewelry you’ll take with you. Make two copies. Take one copy with you and store it separately from your jewelry. Leave the other copy at home. Also helpful: take pictures or a video of your jewelry. • Never put jewelry in checked baggage. Instead, wear it or stow it in your carry-on bag. If you wear it, take extra care by slipping a pendant inside a sweater or turning your ring so only the band shows. • Put your jewelry in a favorite bag you’ll carry while traveling. Don’t leave your jewelry in an unattended car or suitcase. • When checking into your hotel or condo, don’t hand your jewelry bag to hotel staff. Carry it personally. • Always store jewelry in the hotel safe when not wearing it. • Insure your personal jewelry against loss, damage, theft and mysterious disappearance wherever your travels take you, worldwide. So get the right insurance. Then relax, be yourself and have fun. Credits: Screen captures via www.wfaa.com. Welcome to Music Friday when we bring you awesome songs with jewelry, gemstones or precious metals in the title or lyrics. 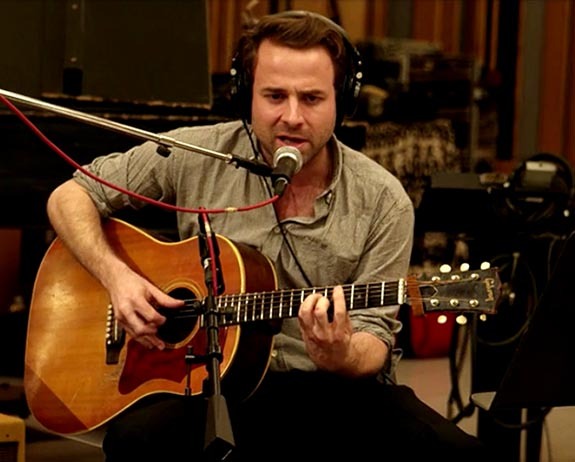 Today, Taylor Goldsmith of the folk-rock supergroup The New Basement Tapes channels Bob Dylan in "Diamond Ring," a nearly forgotten song about second chances. In the tune, the song's protagonist is heading back to St. Louis, where he's hoping to reconnect with his old flame, Alice. And this time he's willing to make a life-long commitment. He sings, "That old organ grinder's gonna wind his box / And the knife sharpener's gonna sing / When I get back to St. Louis again / I'm gonna buy that diamond ring / Diamond ring / Diamond ring / Shine like gold / Behold that diamond ring." "Diamond Ring" is one of more than 100 songs Dylan wrote in 1967 while recovering from a near-fatal motorcycle accident in his Big Pink home near Woodstock, N.Y. While 16 of those works went on to be included in Dylan's highly regarded 1975 album, The Basement Tapes, many of the other songs, including "Diamond Ring," remained forgotten — until recently. With a nod from Dylan himself, producer T Bone Burnett assembled a supergroup of "musical archaeologists" — including Goldsmith, Elvis Costello, Marcus Mumford, Jim James and Rhiannon Giddens — to re-imagine many of Dylan's "lost" works. The all-stars recorded more than 40 Dylan songs during a two-week session, according to music.avclub.com. The creative process saw members of the group swapping instrumental and vocal roles on the different album tracks. The group eventually released two versions of Lost on the River: The New Basement Tapes in November of 2014. "Diamond Ring" appears as a bonus track in the deluxe 20-song version. Goldsmith, who is best-known as a member of the Los Angeles-based folk rock band Dawes, has collaborated with Dylan before. His band toured with the legendary singer-songwriter in 2013. Written by Bob Dylan and Taylor Goldsmith. Performed by The New Basement Tapes. Credit: Screen capture via universal-music.de.